For sixteen years, a yellow sponge named Bob who lives in a pineapple under the sea, has been a part of children’s culture (and secretly making adults laugh at the same time). Now SpongeBob SquarePants is back in his second motion picture – as weird and fun as ever. What’s nice about SpongeBob is that once you’ve seen one episode, you know whether or not it’s your cup of tea. For fans, the franchise has not only maintained its quality, but it has become more comfortable in its spongy skin. 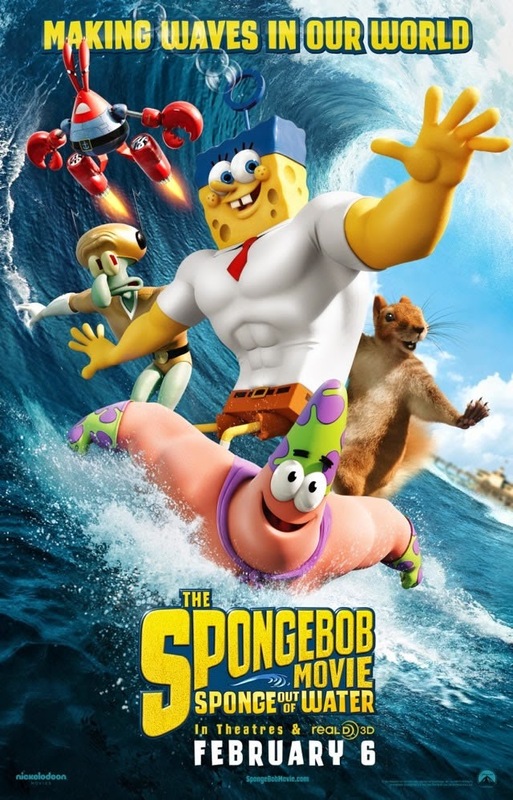 In THE SPONGEBOB MOVIE: SPONGE OUT OF WATER, the whole Bikini Bottom gang is back, led by Patrick Star (Bill Fagerbakke), Mr. Krabs (Clancy Brown), Squidward (Rodger Bumpass), Plankton (Mr. Lawrence), Sandy Cheeks (Carolyn Lawrence), and of course SpongeBob himself (Tom Kenny). Much like the last film, THE SPONGEBOB MOVIE, the crew is on an adventure in this story. Last time around SpongeBob and Patrick searched for King Neptune’s crown. In SPONGE OUT OF WATER, they are seeking Mr. Krabs’ Krusty Krab secret recipe, which has vanished. The story line is straightforward and only serves as a framework for a barrage of quirkiness. As the title implies, part of the movie does take place above the ocean surface this time around. Setting the scene is Antonio Banderas as Burger-Beard, the narrator (who is reading the book to a group of wise-cracking pigeons). Banderas goes all in as a pirate with an ulterior motive. SpongeBob suspects Plankton, a known franchise villain, is the one responsible for the missing recipe. But he’s innocent. So together, they begin searching for the recipe as a team. Plankton has trouble pronouncing the word “team” because he has so rarely used it (a gag that produces more laughs than it should). The journey is all over the place. We see the ocean floor turn full on apocalyptic – when the Krusty Krab is closed down, of course. We spend time inside SpongeBob’s brain, we take a trippy adventure to space and meet a dolphin that rules the galaxy, and eventually get to see our characters turn three-dimensional. Advertisements have sold the movie as mostly happening above the water, where we see the characters take on a three dimensional look. That’s not totally accurate. At most, one-third of the film takes place “out of water.” For the most part, viewers will recognize that old familiar animation from the Nickelodeon cartoon. Kids may be a little disappointed SpongeBob and his friends aren’t out of the water a bit more, but I found it to be a good decision. While the 3D animation is excellent, the style would have been tiresome if used for the whole movie. SpongeBob deserves to be commended for their experiments in animation in this film. From classic to Claymation to stop-motion, it’s a visual feast. One concern with SPONGEBOB: it might not always be as funny as it thinks it is. It has a tendency to harp on one joke for too long and the lack of story sometimes feels obvious. In spite of all this, SpongeBob always seems to strive for smarter kids comedy. There’s a real sense that those who have worked on SpongeBob love their characters (director Paul Tibbitt has been with the franchise since 2004). Not to mention the voice actors who give the whole thing life. Tom Kenny, who has always voiced SpongeBob, has been the secret ingredient giving SpongeBob a voice that is funny, silly, and a little unnerving.